The answer...I AM TOTALLY AWESOME! (Said with the utmost humility.) 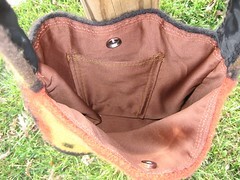 This is the unveiling of my "Newest Project" from below. I have been so giddy with this purse. It took for freakin' EVAH to complete...though it was due to my over thinking of the construction rather than the actual difficulty of the project. 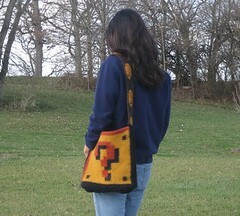 I knew how I wanted to do the front, back, and strap, but I couldn't decide how to actually make it into a purse. The answer was absurdly simple, so when I make this again (oh yes, it will be mine), it will go ever so much more smoothly. 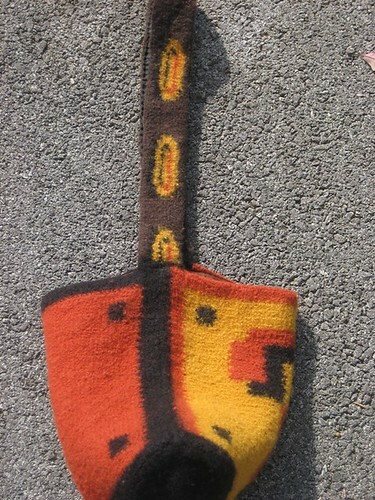 It is, of course, crocheted and then felted. I was very pleasantly surprised at how large it ended up. 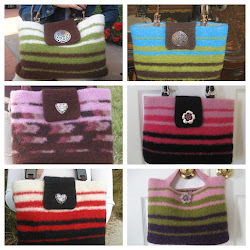 You never know with felting. 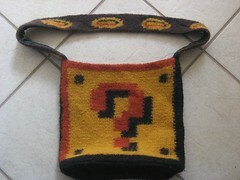 I was so afraid that I put in so much effort into this Koopa Coin purse, just to end up with, well, a coin purse. I did line this bag...as well as the strap. 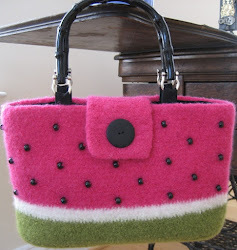 It is actually the bag I used for the upcoming video tutorial on how-to-line-felted-bags. Hopefully I'll have that up over the weekend...since my hubby is the editor, we have to wait for his timetable. Here is my parting shot...I love how the bag fits in with the artistic composition...BIG QUESTION MARK: who is this girl? where is she going? 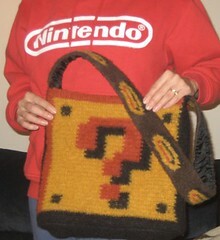 where did she get that TOTALLY AWESOME BAG???? that is SICK. way to go. Thank you Anon ;) This one is my ultimate favorite that I've made so far! That, as well as all the rest of your projects, is totally off the hook! I can't even believe how awesome these projects are. omg please a pattern or at least some in-depth explanation of your workflow! Oh this is soo cool! 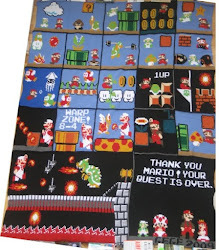 I would love to see the pattern for this =D Great job! This. Is. AWESOME. I join the line of people who'd love a pattern. Awesome work! Love this bag. 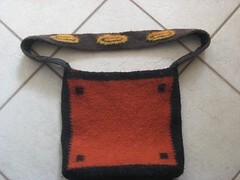 Just wondering, did you use tunisian crochet on this as well before felting? Thanks! !